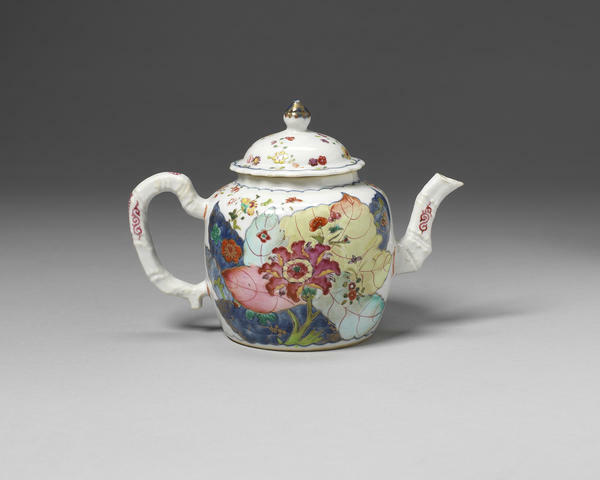 A ‘tobacco leaf’ famille rose teapot and cover, circa 1775. Estimate £4,000 – 5,000 (€5,400 – 6,700). Photo Bonhams. 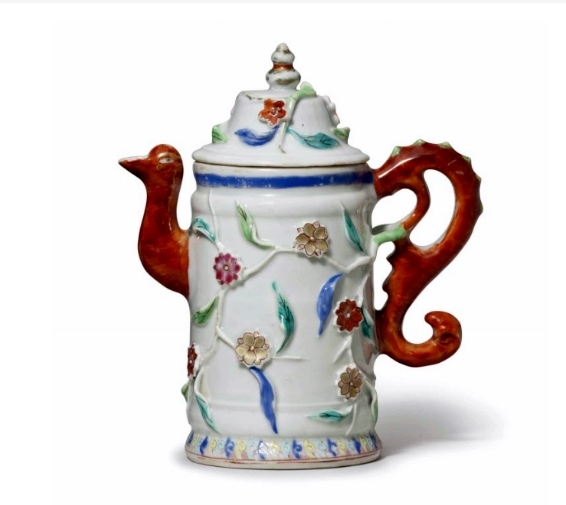 Finely enamelled and painted in underglaze blue with passion-flowers and smaller flower heads, some details highlighted in gilt, the handle and spout shaped as bamboo trunks, the cover en-suite. 19.5cm (7 5/8in) wide (3). A Chinese export famille-rose bowl, Qing Dynasty, 19th Century. Estimate 1,000 — 1,500 GBP. Photo Sotheby’s. 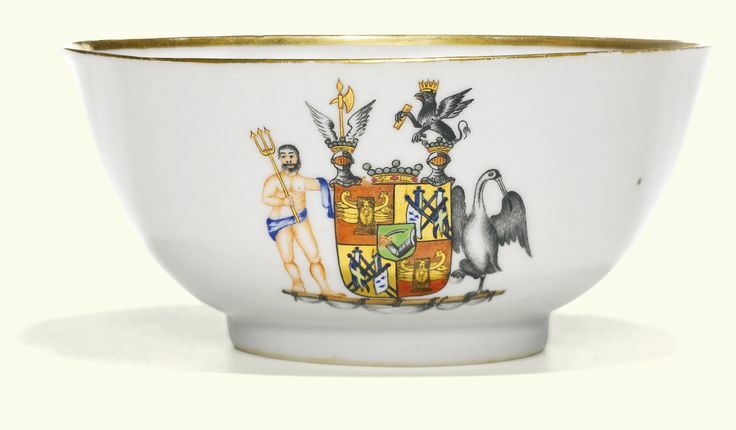 the deep rounded sides resting on a short straight foot, brightly painted to the exterior with the arms of Nauckhoff of Sweden below the gilt-rim- 13.9cm., 5 1/2 in. 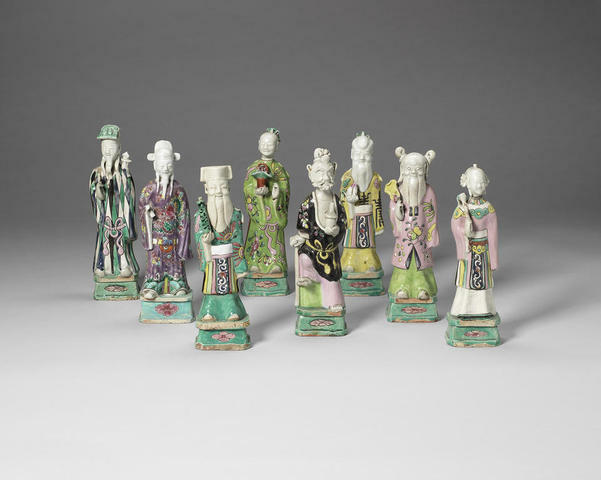 Eight famille rose figures of Immortals, late 18th century. Estimate £600 – 800 (€800 – 1,100). Photo Bonhams. 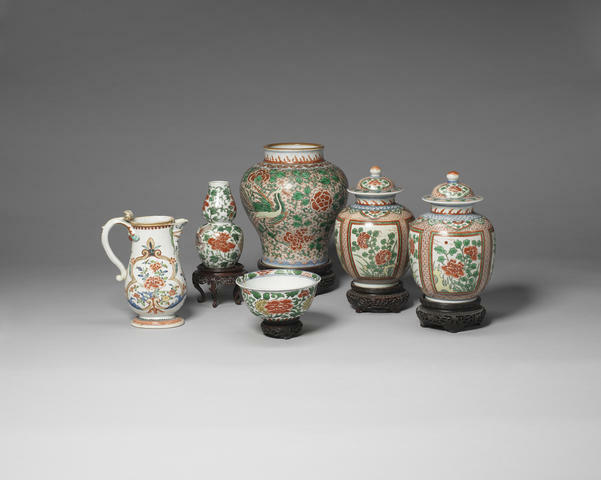 A small collection of porcelain, 17th century and later. Estimate £1,500 – 2,000 (€2,000 – 2,700). Photo Bonhams. Comprising: a blue and white bowl painted with the Eight Immortals, the base with a six-character mark bao shui yu shi zhi zhen; five famille rose plates; an octagonal white-glazed bowl; a wucai double-gourd vase, baluster jar and small bowl; a pair of wucai-style jars and covers; a famille rose ewer; and a group of wood stands. The blue and white bowl: 19.4cm (7 5/8in) diam. (29). 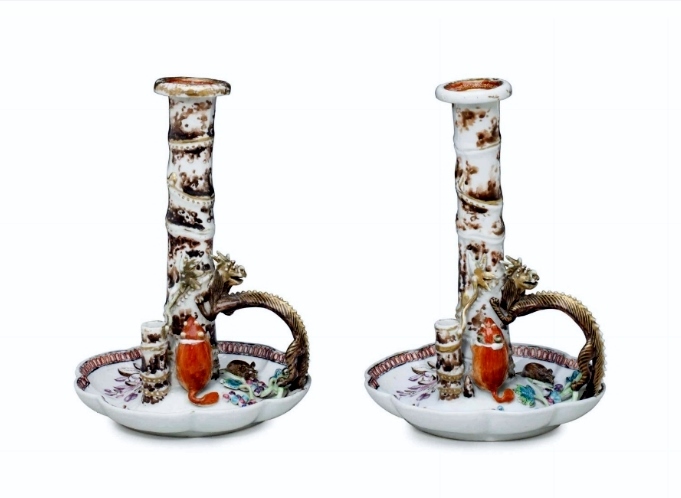 A pair of famille rose candlesticks with tree-shrews, circa 1785. Estimate 6,000 – $9,000 USD. Photo Christie’s Image Ltd 2015. Literature: op. cit., p. 145, no. 9.2. Christie’s. 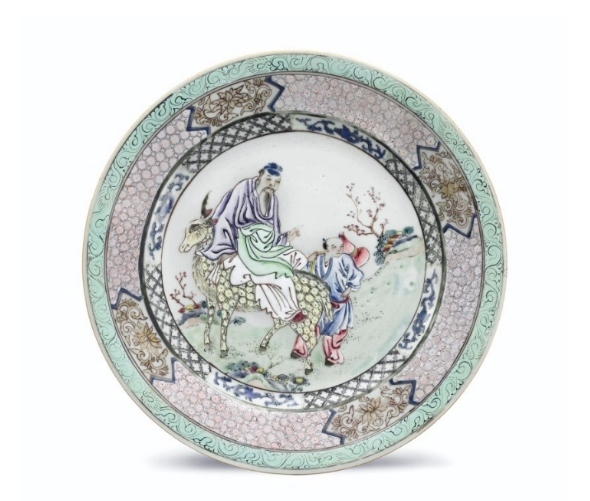 MANDARIN & MENAGERIE: THE SOWELL COLLECTION AND CHINESE EXPORT ART FROM VARIOUS OWNERS, 26 January 2015, New York, Rockefeller Plaza. A famille rose wine pot and cover, circa 1745. Estimate 4,000 – $6,000 USD. Photo Christie’s Image Ltd 2015. 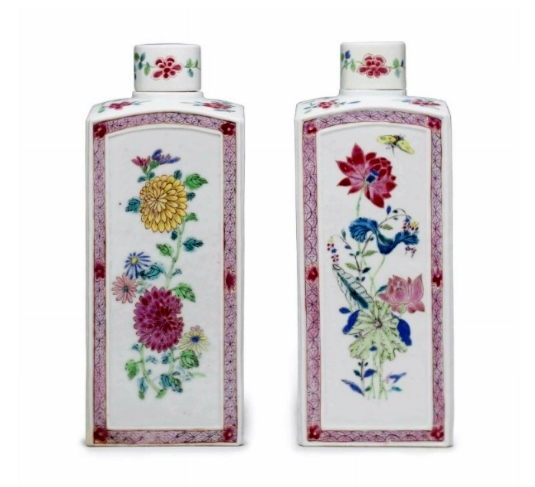 A pair of famille rose gin bottles, mid-18th century. Estimate 7,000 – $10,000 USD. Photo Christie’s Image Ltd 2015. A famille rose plate, Yongzheng period. Estimate 5,000 – $8,000 USD. Photo Christie’s Image Ltd 2015. 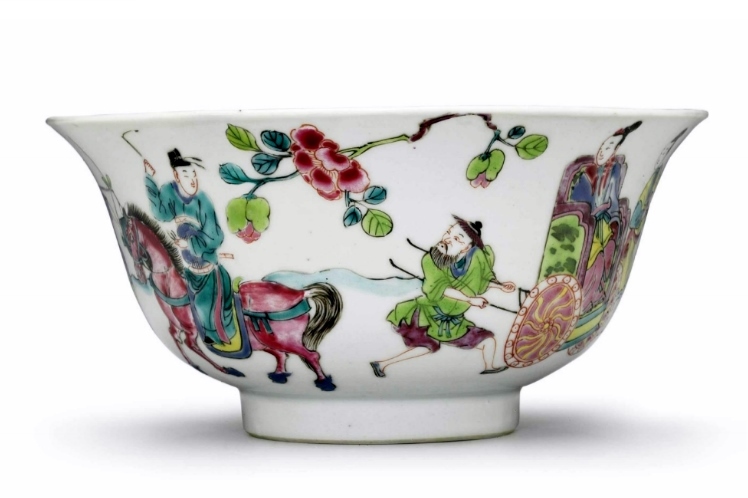 A famille rose bowl, Yongzheng mark and period. Estimate 6,000 – $9,000 USD. Photo Christie’s Image Ltd 2015. 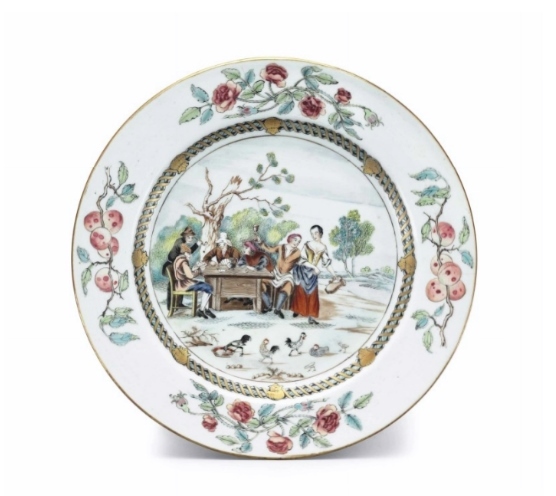 A famille rose ‘Card players’ plate, mid-18th century. Estimate 3,000 – $5,000 USD. Photo Christie’s Image Ltd 2015. Note: The scene is after an engraving based on David Teniers’ Fêtes Champêtre.